The small nation to the south of China is rising in the manufacturing industry and quickly becoming one of the largest exporters of garments and textiles in the world. It’s considered a developing nation, but Vietnam is capable of high quality manufacturing while providing lower production costs at the same time. Bordering the manufacturing giant that is China, Vietnam benefits from the manufacturing expertise that continues to spill over as existing factories in China become more and more overcrowded. Chinese manufacturers have been moving their factories to Vietnam since the early 2000s because Vietnam offers refuge from the brutal competition of Chinese businesses. This is turning a large portion of Vietnam’s manufacturing industry into an extension of China’s industry. Whether a factory in Vietnam is run by a Chinese or Vietnamese owner, the factory still benefits from Vietnam’s prime location. Not only can it quickly outsource production materials and equipment from China, but it can also ship finished goods from one of the country’s many international trade ports. Shipping by ocean can be 6 times less expensive than by air so manufacturing in a country with several trade ports is a huge cost advantage. 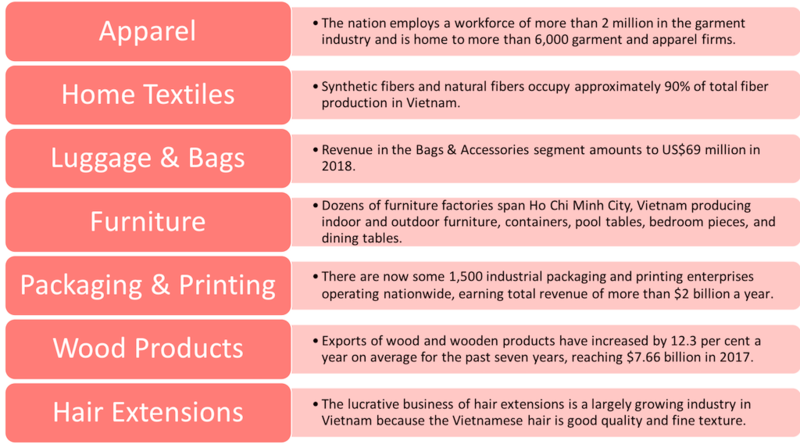 If you haven’t considered finding a manufacturer in Vietnam, our page will give you insight into the relevant costs and manufacturing dynamics that are special to Vietnam. The government has placed strict environmental regulations and protection laws on the manufacturing industry. Since the industry is still growing, it has the potential to move in a sustainable direction with the help of outside investors and international brands. “Vietnam has the potential to lead the way to greener practices in Asia.” The DBW factory was a green project completed in 2016 in the province south of Ho Chi Minh City. It is the first factory in Vietnam equipped with solar panels to provide up to 20 percent of the energy required for operations during dry seasons. It’s also one of the only factories in Vietnam providing air conditioning throughout its premises. For now, this is one of few factories pursuing green initiatives, but sustainable manufacturing practices have the potential to take off as infrastructure continues to upgrade. eCommerce businesses looking for eco-friendly production should consider sourcing options in Vietnam. Since the manufacturing industry is still growing, Vietnamese manufacturers are more willing to accept smaller order quantities than those in China. At best, factories are willing to produce an MOQ at 250-300 pcs compared to a Chinese factory that generally requires 1000 pcs. This is great for smaller businesses or eCommerce startups requesting smaller production runs. In the garment and textile industry, factories produce goods such as jackets, pants, coats, towel products, and a wide range of sewn items due to advancing sewing capabilities. Sewing, quality control, and packaging are all done in-house, but many of the raw materials like cotton have to be outsourced. Fabric production only meets 15-16 percent of domestic demand due to lack of domestic cotton suppliers. Every year, garment factories import 80-90 percent of total cotton demand. 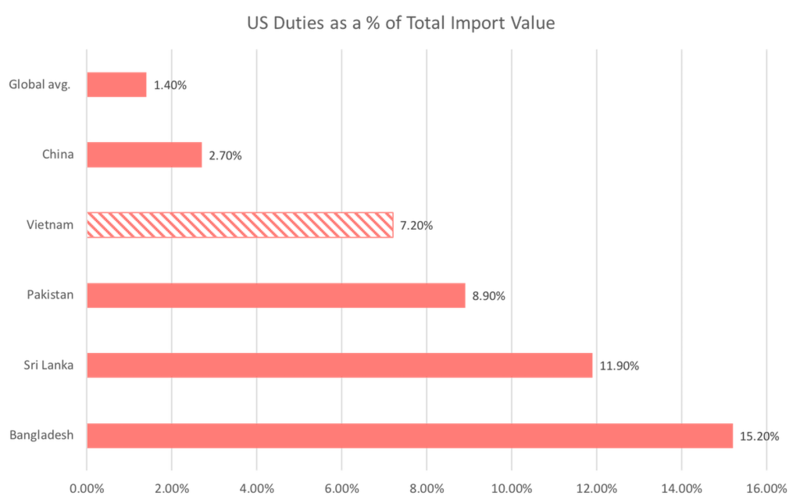 Any time a factory has to import materials to produce your products, you’ll end up paying more per product unit. Most apparel and home textile factories employ anywhere from 500-2,500 workers. A smaller factory with 500 workers has an annual capacity of about 300,000 pieces. A larger factory with a few thousand workers produces millions of garments each year. The factory capacity is important to consider when you’re searching for a manufacturer because a small capacity won’t allow you to grow. You may receive better quotes from a smaller factory, but it isn’t going to benefit you longterm when you’re ready to scale production. The infrastructure in Vietnam is standard for a country in its stage of development, ranking 79th out of 138 in overall quality of infrastructure. The government is taking steps in the right direction to improve factory structure standards and realizing the positive impact of manufacturing on the economy. The real benefit to manufacturing in Vietnam is the shipping advantage. The country has two international airports, several major ports, reliable power, and easy access to the internet and cellular networks. Since the country is small, most suppliers are located close to an airport or major port. All major freight forwarders and air couriers such as DHL and FedEx have facilities in Vietnam. The one big thing to consider is the fast trade growth against the slow infrastructure improvements. A major railway connecting Hanoi and Ho Chi Minh City, where the major international airport is located, hasn’t been upgraded in decades. There is also the threat that ports will reach maximum capacity in the face of increased trade volume. A third reality is that only 20% of national roads are paved. When the means of transporting your finished goods from the factory to a distribution center become unreliable, you add risk into your supply chain. The one aspect of manufacturing that can’t be negotiated or changed easily is the skill of labor. 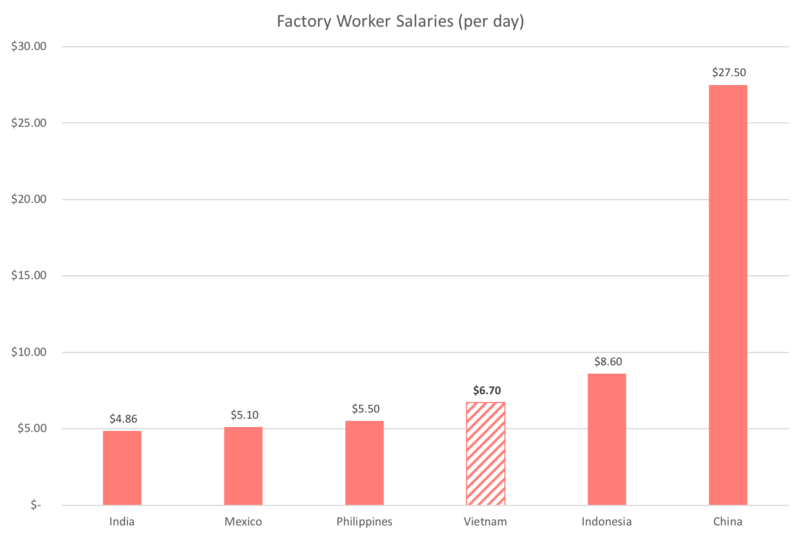 The manufacturing industry in Vietnam continues to grow and strengthen for many reasons but mainly due to the abundance of highly skilled workers. The Vietnamese are skilled at hand assembly work and the quality of hand assembly work is very competitive. The workmanship standards are high so low-quality products are rare. Consistent high quality production is an advantage but can turn into a disadvantage if turnaround times are slower. As long as the factory has efficient infrastructure and organization, the high quality production adds value to your product or branding. Worker salaries have either a big impact or a HUGE impact on your cost per unit depending on your product. Products that require expensive materials or materials that must be outsourced will still have a higher unit price. Wages will make up less than 20% of the final unit price once material costs are factored in. However, you’re still looking at an increase of 15-20 percent in savings. This is big. If your product is simpler or the factory has most of the necessary components, you’ll definitely notice the HUGE impact of a significantly lower unit price. 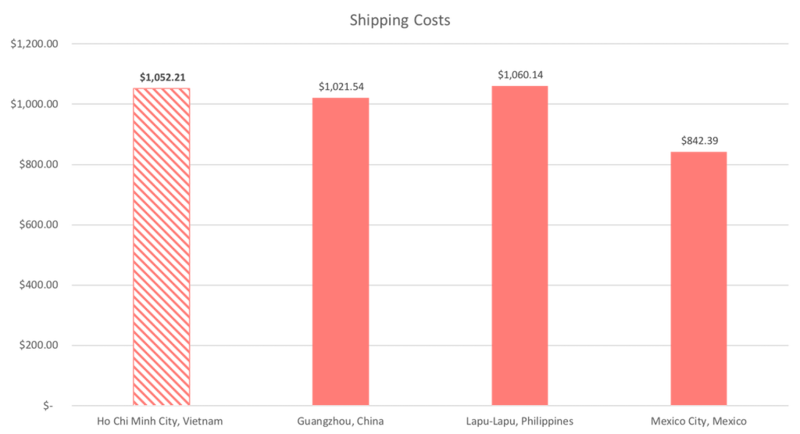 The graph is an example of what it may cost to get a medium size production order of apparel shipped from your manufacturer. In this case, the shipping includes the base rate and any other additional taxes. Shipping from Vietnam, the cost includes an additional charge known as “declared value” which is basically the insured value. The declared value of this shipment makes up over 50 percent of the shipping cost. Each courier has its own policies regarding additional taxes and surcharges. There are also additional taxes that are imposed by the country of origin, but there are no imposed taxes to ship out of Vietnam. Depending on where you need your shipment to arrive from Vietnam, you may face duties or tariffs (custom duties) to get them into your home country that will increase your shipment cost. The import duty paid on your shipment depends on the quantity imported. The tariff relates to the harmonized tariff system codes where imported goods are classified. The corresponding tariff would be a taxed percentage at a rate specific to your product. Custom duties also vary by country of origin so knowing whether your product will be levied with taxes to import from Vietnam is something to find out. When it comes to shipping to the United States, Chinese exports aren’t the only goods affected by tariffs. Currently, Vietnam actually faces one of the highest import duties on clothing. Vietnam contributes to a trade flow into the US, which now imports more than 97 percent of its clothing. But the custom duties on goods from Vietnam are swept under the rug as the news of Chinese tariffs takes the media. Considering policy and duty rates is hard because they are dependent on the economic times. But if you’re just starting out, these extra taxes can kill your margin. Vietnamese suppliers aren’t as easy to find online, as many still rely on trade shows to find overseas customers. Some can be found on typical marketplace websites such as Alibaba, but they are few and far between. Access to Vietnam factories requires building connections in the country, or finding a reliable sourcing agent. A sourcing agent can also help you verify your factory and connect you to quality inspection facilities. Most quality inspection companies have offices in Vietnam so you can ensure your products and processes reach international standards and live up to your expectations for high quality production. That being said, you have to do more than just a quality inspection to complete a thorough due process of your supplier. Sometimes a manufacturer in Vietnam can accept an order without the resources to make a timely delivery. If you fall victim to one of these manufacturers and express your discontent, they will often close shop without leaving a forwarding address. It may also be necessary to check on your prospective manufacturer’s financial standing. A close examination of their finances will help you understand whether they are capable of handling your order, especially if it’s a large order, and indicate whether they can fulfill their end of business. You will also need to verify their status as exporters and their creditworthiness before placing an order. Lursoft is a great search engine for certificates and other information on a potential manufacturer. The beauty of Sourcify is that we connect you with pre vetted factories located around the world, including Vietnam, so due process is one thing you don’t have to worry about. You can also manage production and communicate with your manufacturer through the Sourcify platform. Production is made faster and easier with the platform and factory connections that Sourcify offers.